Your Favorites & Our Bread & Butter ! Sincere Interest In "Pleasing You"! 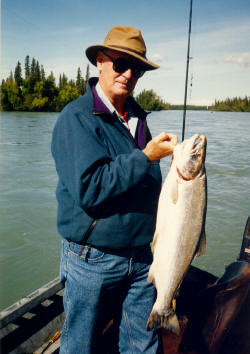 "The River" & "River & Sea" Are Our Most Popular Trips" with "The Boys Gone Fishin' Again ! Couples Looking for a "Lot" of Fishing and The "Extended Male Family"
We Want Your New Business And... We'll "Do What It Takes To Get It"
there is up here in the KENAI RIVER area. You'll Have A Great Time!" 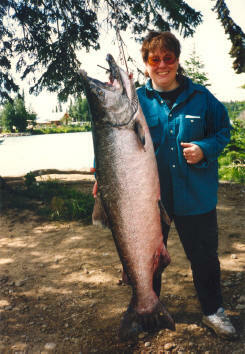 Four Decades ~ Our "Handshake & Professional Competence"
Produced "Great ALASKA Fishing Trips" & "Generation After Generation Friendships"
We've Never Done and Still Won't Do "So So or Good Enough"
We Do Offer "Exactly The Trip" You Want "Value Added ~ Superior Service"
Today ~ We Want Your New Business And... We'll "Do What It Takes To Get It"
We Are "Fishing Guides" in the "Fishing Business"
Our trips maximize your fishing experience and not our income today. 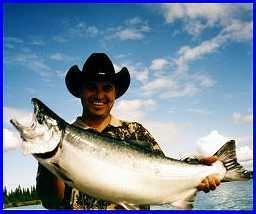 Your fishing experience "today" maximizes our income "in the future" ! To give you the absolute best chance to experience "good fishing". OUR FISHING TRIPS ARE SCHEDULED "ONE TRIP PER DAY" ~ YOU ! We could generate more money with two half day trips, but we don't. 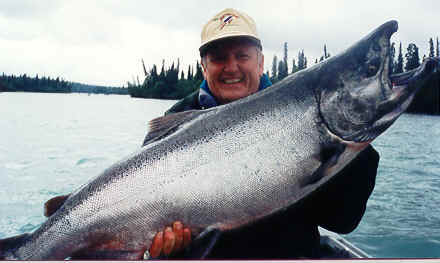 For The "Die Hard Fisherman" On Vacation "Where It Won't Get Dark"
A Popular Way to Extend Your Cruise is "Fishin' The Kenai"
The "Intimacy of Two" or The "Whole Darn Family"
ONE HELL OF A PLACE FOR THE COMPANY PICNIC ! 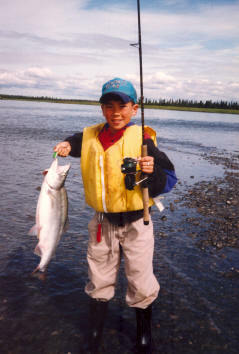 Hard to find time to Golf and Fish ~ Not "On the Kenai"
We've Got The Big Bertha or Ping Putter Package Just Right For You ! These trips will dove-tail with your fishing plans. Denali Nat'l Park . Kenai Nat'l Wildlife Refuge . Chugach Nat'l Forest . are filleted, froze, ( smoked ? ) and vacuum sealed and boxed. They can "go with you as luggage" or be shipped after you are back home. We will assist in any manner that you need. Airline reservations, discount rental vehicles, "suggested" equipment & clothing. You'll receive driving directions & on - line Fishing License info. You're In "Experienced" Hands Let Us Put This SMILE "On Your Face"
expected to happen to us"
already looking forward to the trip. But it can't be as good as last year."